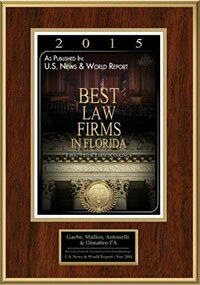 GAEBE MULLEN ANTONELLI & DIMATTEO takes great pride in acknowledging our attorneys who earned Martindale-Hubbell’s highest rating, AV Preeminent® – an outstanding achievement. GMA is dedicated to achieving excellence and favorable results for our clients through the application of legal knowledge and skill with the utmost professional and ethical ability. We are proud to know that countless lawyers and judges have witnessed our attorneys in the pursuit and achievement of excellence. The GMA team of 19 litigators is committed to consistent representation of corporate, institutional, and individual clients’ interests from courtrooms to boardrooms, through investigation, mediation, trial and appeal. The GMA team of seasoned attorneys, together with our new associates, continues the firm’s almost 30-year history of serving our clients with a sophisticated litigation support system and contemporary concepts to attain the best possible outcome.